We'd been waiting for this new gloss formula of this varnish. Now in stock! We tested it on plywood, epoxy-coated plywood, and un-sanded ash. It worked great on all but looked especially nice on the ash. 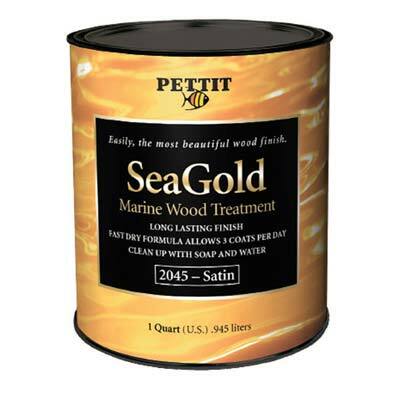 From the manufacturer: SeaGold brings marine wood finishes into the 21st century. Offering the beauty and durability of varnish, the ease of use of synthetic wood treatments, all while being low-odor and user friendly. 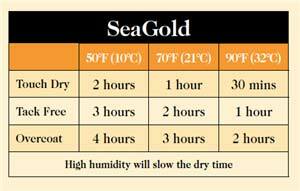 SeaGold protects the wood using UV stable resins combined with added UV inhibitors as well as transparent pigments to provide a long lasting finish that will not turn brown or orange with exposure to the elements. SeaGold enhances the beauty of the wood and its translucent amber color does not hide or blur the wood grain. * Ours is the new gloss formula, not the old satin which was very flat. Goes on well over epoxy.